Greetings From Daytona Beach! I will be in my hometown for the next week, gearing up for one of my Best Friends wedding this Saturday! I decided to switch up my training plan. First, I am reintroducing the Galloway method to my training plan. I started off running Galloway and broke up with it halfway into my first half marathon training. The main reason I am going back to the 4/1 ratio is because I start training for the Dopey Challenge in 6 weeks. Second, we have always done our workouts after work. There are many times where I am not in the mood, I am tired or I just want to relax with a glass of wine and I think - I will do it tomorrow. These thoughts have gotten me in trouble over the last three weeks, only working out once a week. Oops. I figured now would be the perfect time to revamp my training plan and take care of my workouts first thing in the morning. Sounds great right? Well, I am not a morning person, not at all.This will be a struggle. I started this morning with a big internal fight with myself. Finally at 7:30am, I started off with a 3 mile run through my parents neighborhood. They live in golf development and it was nice not to have to fight traffic. 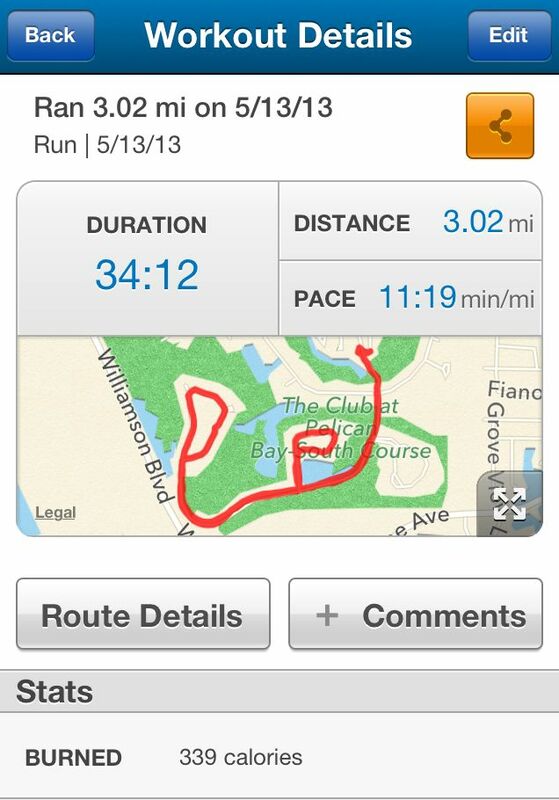 I only dodged one golf ball during the 3 miles. The four minutes on went by very quick while the one minute walk went by even quicker. I didn't find myself out of breathe and my time was 30 seconds slower per mile for my average pace. Not too bad for multiple walk breaks. It felt great to get those endorphin's flowing first thing in the morning.When I got back home, I had to jump on a conference call and decided to multi-task by making breakfast at the same time. I actually forgot about my morning coffee until 10:30! Instead of my usual protein shake or smoothie, I decided to make a fritatta with whatever I found in my Mom's refrigerator. Preheat oven to 350. Steam veggies for 1 minute in the microwave. Add to an oven safe pan and sautee for 1 additional minute along with garlic and other seasonings. Meanwhile, beat your eggs and milk together. 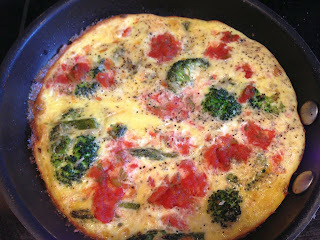 Pour egg mixture over veggies and cook for 1-2 minutes. Transfer to pre-heated oven for 25 minutes. The great thing about this recipe is it's very veristale. You can use pretty much any leftover vegetable or meat in the recipe and is perfect for cleaning out the fridge! 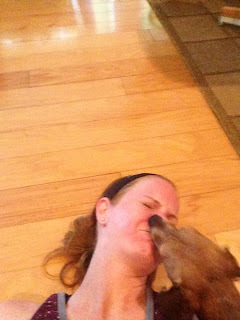 In other news, my Dachshund Deezyl is very happy I am home for the week and it looks like he likes me running in the morning as well. My nose feels so violated! Run/Walk will be a great way to tackle Dopey. I'm not a morning runner wither but am thinking of making the switch. I have the same problem come afternoon--tired or busy. Mornings won't be easy but at least the workouts will get done! Love this post! Felt like you were talking to me the whole time. Good for you for getting back "in it." I've been enjoying morning runs myself now that I'm working from home! I hate the beginning of it but ya feel SO much better after...alive and revitalized!!! Deezyl is too cute.